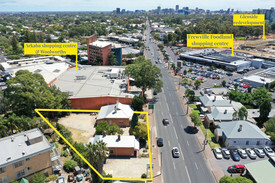 230 Commercial Real Estate and Properties in Adelaide are listed in 8 categories. We have 203 Offices for Sale & Lease , 96 Retail Shops for Sale & Lease , 53 Industrial Warehouses for Sale & Lease , 13 Medical and Consulting Properties for Sale & Lease , 12 Showrooms for Sale & Lease and 12 Development Lands for Sale & Lease . | 5 Person Workspace | P..
PROPERTY OVERVIEW $420pw Price incl. A collaborative managed space on Adelaide’s Flinders Street, this vibrant office features cutting edge design with serviced offices, meeting rooms and event space plus 24/7 access and bike storage. The workspace occupies three floors with offices and collaborative areas, all with fresh contemporary decor, modern fit outs and a strong focus on creating a close working community. Situated to the north east of Adelaide’s CBD, this office space is within a beautiful heritage listed building with original features throughout. On street parking is available nearby and Adelaide’s public transport options are within close proximity. Our favourite feature at this office building is the funky roof terrace with gorgeous views, perfect for a casual meeting with a colleague or an evening team bonding session with a beer. The advertised work space is perfect for a team of 5. If you need more or less space we have furnished and unfurnished offices ready to go from 10sqm 200sqm all over Australia and New Zealand. What you get for your weekly rent , 24/7 Access , Access to internal breakout areas , Commercial grade internet , Electricity usage included , Flexible terms , Premium Coffee/Tea Facilities , Fully equipped boardrooms, meeting rooms and day offices (fees may apply) , Plug and play furnished workspace , One simple bill for everything related to your workspace , FREE business networking events , Collaborative space with a great community feel Building features , Air conditioning , Bike racks , Dedicated men and ladies bathrooms , Disabled facilities , Modern fit out , Natural light , Showers , Modern communal food preparation areas , Car parking Street (Free) , Company Branding at reception , Concierge on ground floor , Pet friendly office space , Creative co working space Excellent location in Adelaide CBD Multiple bus links within 500m 1.7km from Adelaide Railway Station Car access from Ifould Street Nearby public parking on Pirie Street and Flinders Street WHO IS OFFICE HUB? Office Hub has largest collection of shared office space, sublet office space, creative coworking office space and serviced offices, perfect for 1 200 employees. Let us take you on a tour of all the spaces that fit your needs and budget. Our service is complimentary and we work for you and the landlord to negotiate the most competitive deal in the market. Let us show you how shared and serviced offices can be the perfect solution for your business. www.office hub.com.au www.office hub.co.nz Conditions apply A portion of the square meterage factors in access to shared space. The advertised price includes any incentives offered based on a 12 month agreement. If a shorter period is agreed to please note the price may increase accordingly. This promotional offer for new tenants only and may be withdrawn at any time due to space availability.